Colorado’s hard, compact soil prevents grass from establishing a healthy root system and keeps water and fertilizer from reaching the roots. The best time to aerate your yard is April and September. When the yard is aerated it will pull about a 3 to 4 inch core out of the ground. By doing so, you are allowing the soil to get air, water and fertilizer to reach the turf roots. Stronger roots help the grass tolerate excessive heat and dry conditions. Your yard will have enhanced heat and drought stress tolerance, stronger roots and enhanced soil, water and fertilizer uptake. Aeration will also reduce lawn care maintenance costs and improve the life and health of your lawn. Aeration is one of the best services you can have done to your lawn! Call me today to get a free estimate. 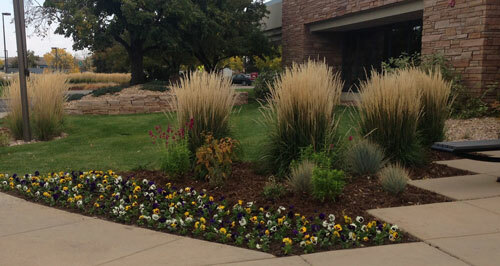 We offer a variety of creative options when planting annual flowers. We can provide options to our customers that cater to seasonal needs. In the fall there is the usual fall foliage that needs to be cleaned up, as well as plants that need to be cut back for winter. We like to clear the leaves before the snow comes in order to better prepare your landscape for the next spring season. In the spring before your plants bloom, Custom Lawns will go through and trim back any dead plant life and remove all leaves, bushes and tree limbs to get your yard ready for summer. We offer a three or five application service. What is the difference? Early Spring (April 1 – May 15) Balanced seasonal fertilizer with iron and weed control. Includes pre-emergent control for crabgrass and insect control for sod web worms. Spring (May 15 – June 30) Balanced seasonal fertilizer with iron and slow release nitrogen. Weed control and insect control as needed. Late Summer (August 25 – October 15) Balanced seasonal fertilizer with iron and weed control. Insect control as needed. Summer (June 30 – August 25) Balanced seasonal fertilizer with iron and slow release nitrogen. Weed and insect control as needed. Post-emergent crabgrass control at no additional charge, if needed. Fall (October 15 – November 30) “Winterizer” — Granular fertilizer designed to promote root growth and give a quick green-up next spring. 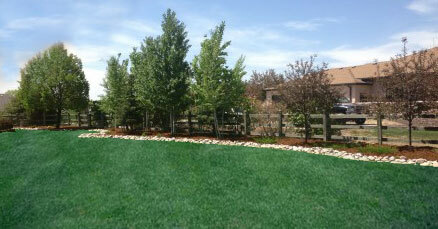 Custom Lawns offers a seasonal package to ensure that your landscaping is maintained at its best. Mowing services are provided 26 times during the summer season. We perform two mowings in April, then weekly from May through September, and two mowings in October. 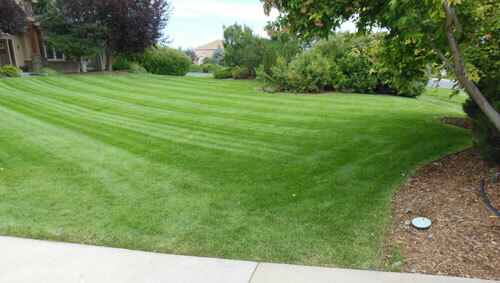 In conjunction with mowing we also trim around all buildings, structures, and other obstacles within the turf area. Driveways, sidewalks and driveway exits will be cleared of all grass clippings after every service. During rainy or extended dry periods, the frequency of mowings may change. Also called dethatching, is a great way to remove the buildup of excess dead grass/plant material. Power raking improves water and nutrient flow to the roots and to stimulate new grass growth. A heavy thatch can choke grass, protect weeds and insects from the elements we use to fight them and increase runoff from rain and watering. Call us today to power rake your yard and get your grass on a healthier path.